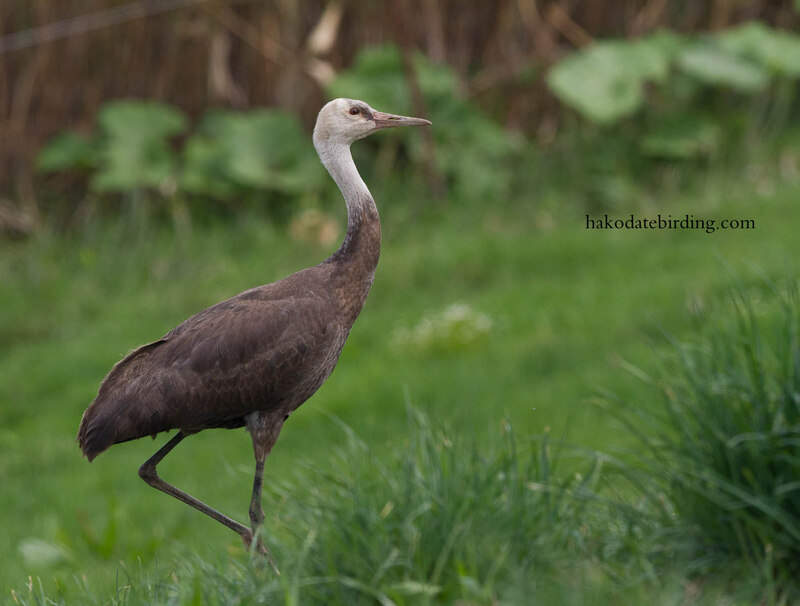 A Hooded Crane near Oshamanbe this afternoon...............and I even took a short video of it. It was a bit foggy today, not great for pictures. 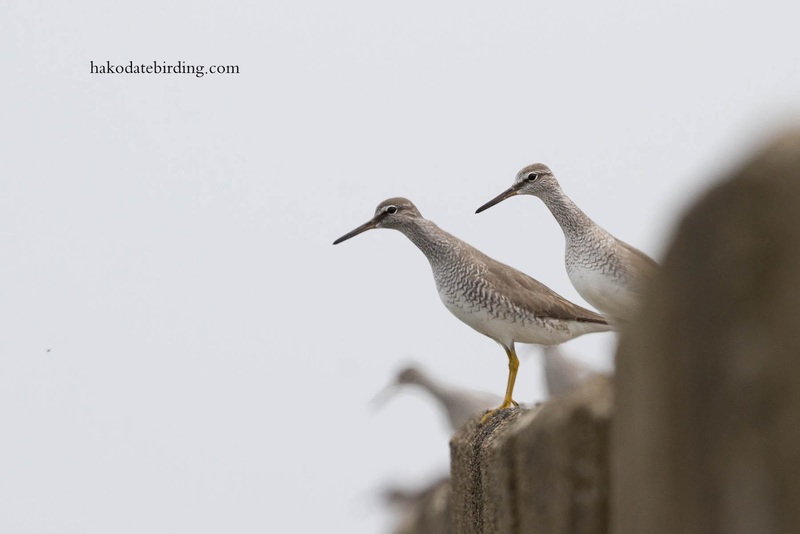 There were a few waders around, mainly Grey Tailed Tattlers like these at Oshamanbe. There were some summer plumage Dunlin around too and at Yakumo there was one Black Winged Stilt. Little Ringed Plover and a small flock of Red Necked Stint. 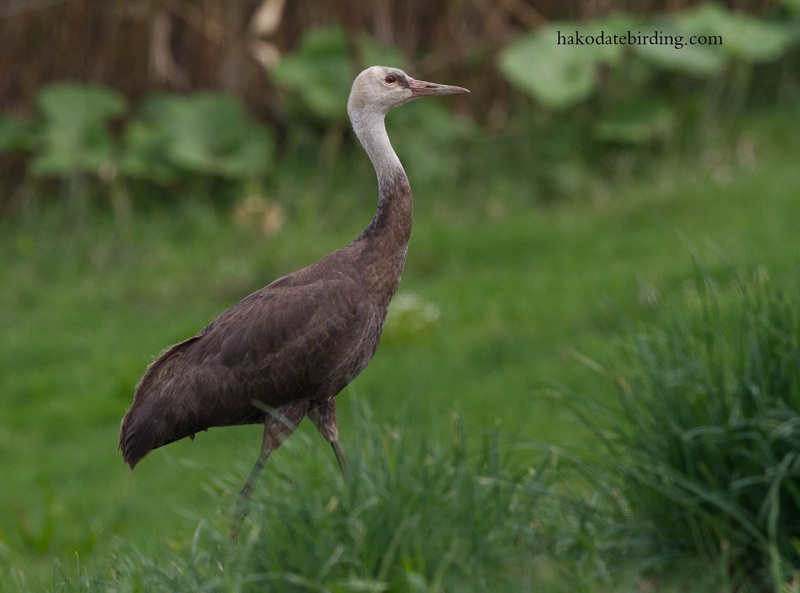 The Crane was probably the same one we saw last autumn. Had it stayed all winter in the area? 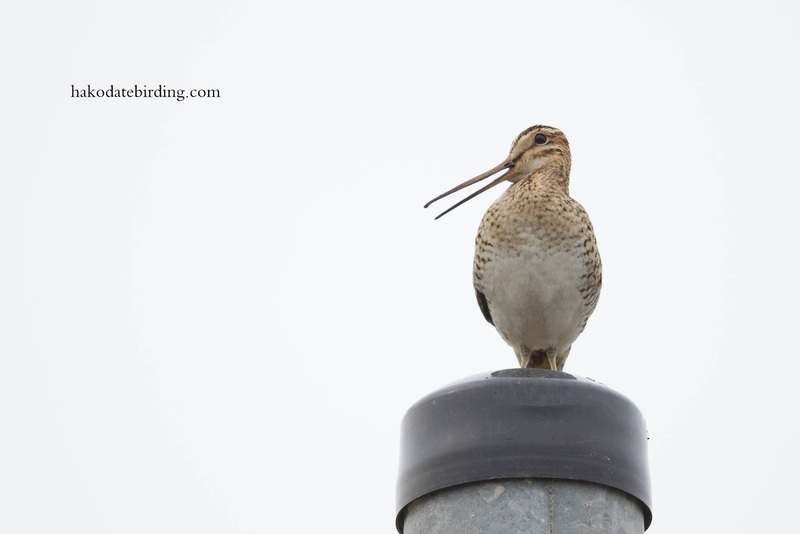 It was difficult to get a good shot of it this time, with the fog, poor light and busy background. 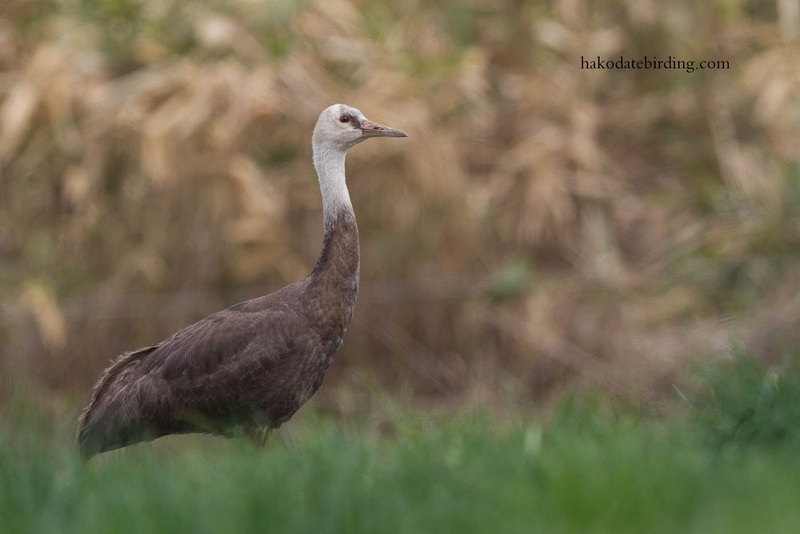 Usually the second week of May is one of the peak birding times of the year (indeed the best week) but 2014 was a huge disappointment compared to previous years. A few warblers and flycatchers passed through town last week but not in any great numbers (and none near the camera). I can't complain after the winter Gyrfalcon and Crossbills but still it's a bit weird. Did the birds pass through unnoticed when I was working? Are there less birds than usual? Are they avoiding Hakodate for some unknown reason? Wow! I have never heard of a Hood Crane so it was lovely seeing your shots and video. thanks. The other shots are great as well even it was foggy. Overall, I think numbers have been down here in Hong Kong this spring. 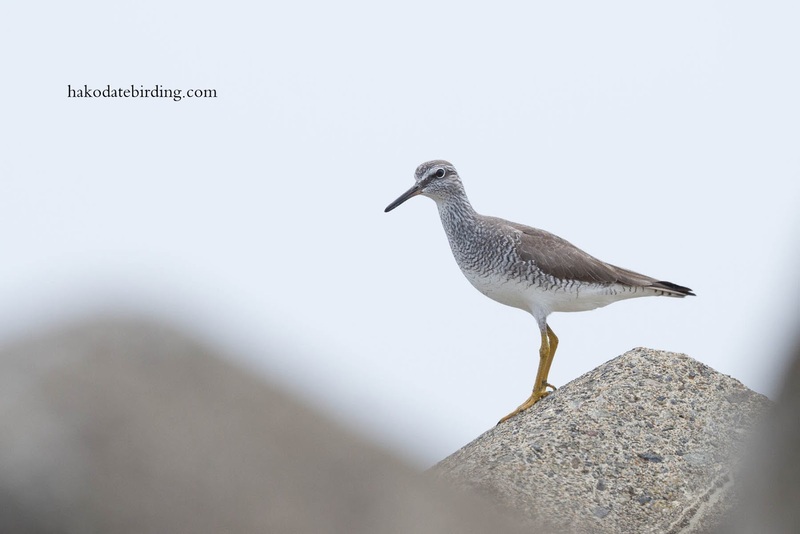 And, obviously, several species on the "East Asian flyway" are declining. And, is it an El Niño year, too ? Hi John, yes I heard it was an El Niño year....................but still, even common species seem very thin on the ground, at least in the places I've been looking. I think there are less birds than usual in Niigata including flycatchers and the wetlands. There used to be tens of thousands of waterfowl at Fukushimagata 9 years ago, now it's just down to a few hundred. I lose my motivation to go out when I spend hours and find little. 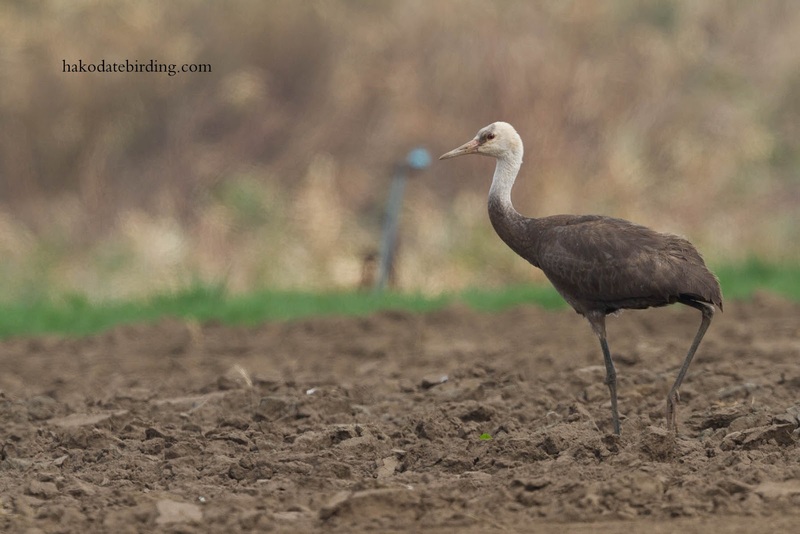 The crane is indeed a nice find and you got good pictures and a great video. Bird numbers are down almost everywhere I walk around Melbourne. It's becoming rather worrying. That said, I really enjoyed the video. It was one of my goals to do some this year, but haven't achieved it yet!